This Chocolate Chip Bread Pudding is a breeze to put together and tends to disappear just as quickly. Try white chocolate chips, butterscotch, dried cranberries, nuts, whatev. Set oven to 400 degrees Fahrenheit, and butter the pie dish. Liberally. Trust me, it’ll be easier to serve from and clean. Cube the bread. This recipe doesn’t care if your bread is fresh or usable as a hammer. Just as long as you can cut it everything will be fine. I find small cubes work best. Measure the 3 cups of bread in the liquid measuring cup. Why not. Save some cleaning time. Put the cubed bread in the pie dish and press it down so it is distributed evenly. Wipe the crumbs out of the measuring cup and measure the milk. Keep the measuring cup around, you’ll use it in a few minutes. Pour the milk in the sauce pan and cook on high heat. As it begins to cook, pour in the sugar and stir occasionally until the milk starts to simmer. Add the eggs at the simmer and continue to stir constantly and quickly. Do this for about a minute. Pour the milk mixture into the measuring cup, then slowly pour from the measuring cup over the cubed bread. Make sure to cover as many cubes as possible, but if you don’t get it all it’s not bad. Using the measuring cup makes it easier to control the flow onto the bread. 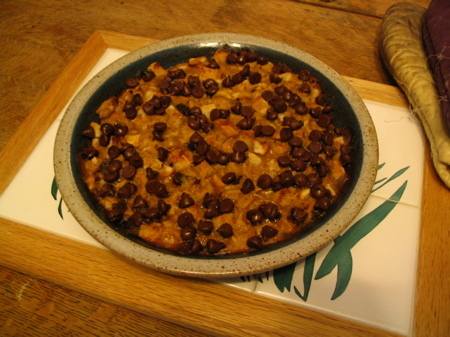 Cover the pudding with the chocolate chips. Put them everywhere, everywhere! Who doesn’t like chocolate chips? Bake it uncovered for 20 minutes. You may want it to go a bit longer, but definitely check it at 20 minutes. When you take it out, let it cool for about 5 minutes. Serve it on its own, or with some vanilla ice cream for sweetness overload. The whole process should take about 35 minutes from start to finish. I make this a lot while guests are talking after dinner. I spend 10 minutes away from the conversation putting it together, and another 5 minutes here and there checking on it. Easy, and it makes everyone say, “You made that just now for us?” Yes, because I love you. And it was easy. Did I mention that part? Recipe adapted from Short & Sweet by Melanie Barnard.